Discover the Santa Catarina Fort, in Figueira da Foz, Coimbra. 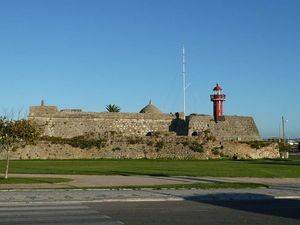 The Santa Catarina Fort, which began to be built at the end of the 16th century, was part of a group of fortifications along with the Buarcos Fort and the Fortim de Palheiros (small fort). Its inside still preserves a small support lantern on the entrance the boats use in the river, as well as a small 17th-century chapel dedicated to Santa Catarina. This fort was occupied by the French during the invasion. On it, the French suffered a tough attack leaded by Coimbra students, commanded by Bernaldo António Zagalo. They ended up reconquering it the 27th June 1808, 33 days after the landing of the troops commanded by Sir Arthur Wellesley. Avenida de Espanha, Figueira da Foz.